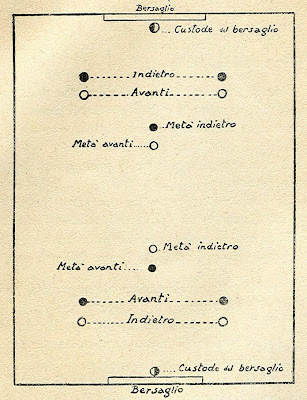 Interesting drawing, within the Italian book about Water Polo edited in 1930 showing the players set-up into the field. One goalkeeper, two backs, one center back, one center forward and two forwards. Source: Il Nuoto ed il Water Polo, Breviari Sportivi 1930.